Not to be confused with Cunninghamia : A Journal of Plant Ecology For Eastern Australia. Cunninghamia is a genus of one or two living species of evergreen coniferous trees in the cypress family Cupressaceae. They are native to China, northern Vietnam and Laos, and perhaps also Cambodia. They may reach 50 m (160 ft) in height. In vernacular use, it is most often known as Cunninghamia, but is also sometimes called "China-fir" (though it is not a fir). The genus name Cunninghamia honours Dr. James Cunningham, a British doctor who introduced this species into cultivation in 1702 and botanist Allan Cunningham. 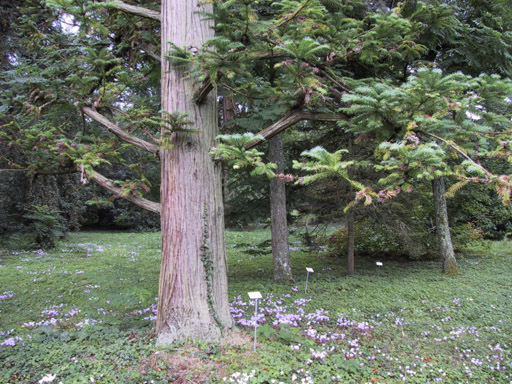 The genus is traditionally said to contain two similar species, Cunninghamia lanceolata and C. konishii, often referred to as the China fir and Taiwan fir, respectively. C. lanceolata occurs in mainland China, Vietnam, and Laos, whereas C. konishii is restricted to Taiwan. However, molecular genetic evidence is suggesting that they are the same species, and that C. konishii of Taiwan derive from multiple colonizations from the mainland. As C. lanceolata was the first name published, this name takes priority if the two are combined. In that case, Taiwan fir becomes Cunninghamia lanceolata var. konishii. However, there is no consensus yet as to whether the two species should be combined. In the past, the genus was usually treated in the family Taxodiaceae, but this family is now included within the Cupressaceae. A few botanists have also treated it in a family of its own, Cunninghamiaceae, but this is not widely followed. In the fossil record, Cunninghamia is also known from America. The general shape of the tree is conical with tiered, horizontal branches that are often somewhat pendulous toward the tips. Cunninghamia bears softly spined, leathery, stiff, green to blue-green needle-like leaves that spiral around the stem with an upward arch; they are 2–7 cm long and 3–5 mm broad at the base, and bear two white or greenish-white stomatal bands underneath and sometimes also above. The foliage may turn bronze-tinted in very cold winter weather. The cones are small and inconspicuous at pollination in late winter, the pollen cones in clusters of 10–30 together, the female cones singly or 2–3 together. 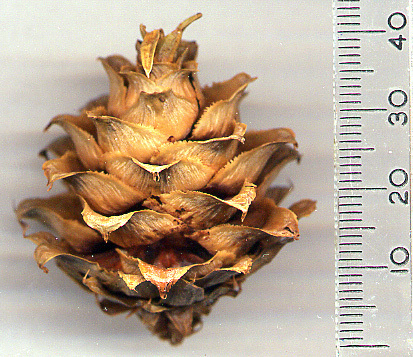 The seed cones mature in 7–8 months to 2.5–4.5 cm long, ovoid to globose, with spirally arranged scales; each scale bears 3–5 seeds. They are often proliferous (with a vegetative shoot growing on beyond the tip of the cone) on cultivated trees; this is rare in wild trees, and may be a cultivar selected for easy vegetative propagation for use in forestry plantations. As the tree grows its trunk tends to sucker around the base, particularly following damage to the stem or roots, and it then may grow in a multi-trunked form. Brown bark of mature trees peels off in strips to reveal reddish-brown inner bark. Older specimens often look ragged, as the old needles may cling to stems for up to 5 years. This tree can be mistaken for the rare Torreya taxifolia, one visible difference being the Cunninghamia's bronze autumn branches which are shed and pile beneath it, as well as the propensity for this tree to have more than one trunk. The Torreya is known as "Florida's gopher wood," as well as "stinking cedar" and the crushed leaves some say smell like tomato, whereas the Cunninghamia leaves do not smell. Cunninghamia is a prized timber tree in China, producing soft, highly durable scented wood similar to that of Coast Redwood and Sugi. It is used in particular for manufacture of coffins and in temple building where the scent is valued. Cunninghamia is grown as an ornamental tree in parks and large gardens, where it typically reaches a height of 15–30 m.
^ a b c d Fu, Liguo; Yu, Yong-fu; Adams, Robert P.; Farjon, Aljos. "Cunninghamia". Flora of China. 4. Retrieved 9 September 2012 – via eFloras.org, Missouri Botanical Garden, St. Louis, MO & Harvard University Herbaria, Cambridge, MA. ^ a b "Cunninghamia". Integrated Taxonomic Information System. ^ Brown, Robert (1866). "On the structure of the female flower in Cycadae and Coniferae". The Miscellaneous Botanical Works of Robert Brown. 1. p. 461. ^ a b Earle, Christopher J., ed. (2018). "Cunninghamia". The Gymnosperm Database. Retrieved 9 September 2012. ^ Chung, J. D.; Lin, T. P.; Tan, Y. C.; Lin, M. Y.; Hwang, S. Y. (2004). "Genetic diversity and biogeography of Cunninghamia konishii (Cupressaceae), an island species in Taiwan: A comparison with Cunninghamia lanceolata, a mainland species in China". Molecular Phylogenetics and Evolution. 33 (3): 791–801. doi:10.1016/j.ympev.2004.08.011. PMID 15522804. Wikimedia Commons has media related to Cunninghamia.